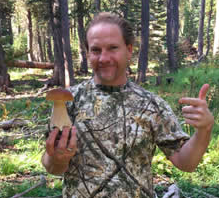 Kingman has been collecting and studying the mushrooms of Sonoma, Mendocino, and Marin Counties for most of his life. His interest is both culinary and scientific. His talk will discuss when, where, and how to look for mushrooms and what to do with mushrooms when you find them. He will emphasize how citizen scientists can contribute to the world of mycology through their hobby. Kingman is an active member of the Sonoma County Mycological Association and can be found at all club events and meetings. He has served on the Board of Directors for the past two years and current President for Sonoma County Mycological Association.